The National Radio Astronomy Observatory announces completion of a major construction milestone on the world's largest fully steerable radio telescope - the National Science Foundation's Green Bank Telescope (GBT). 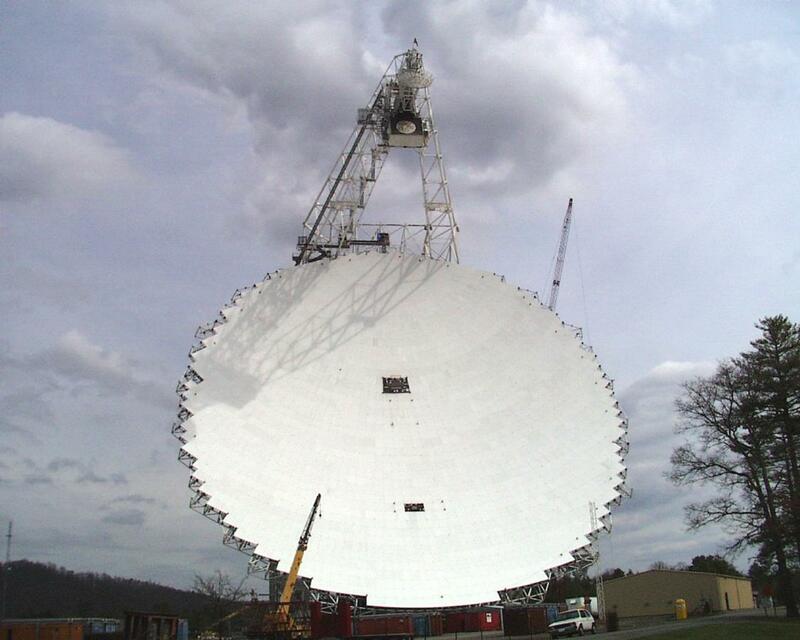 The last of 2,004 aluminum surface panels was recently installed on the GBT's two-acre (100 m x 110 m) collecting dish. 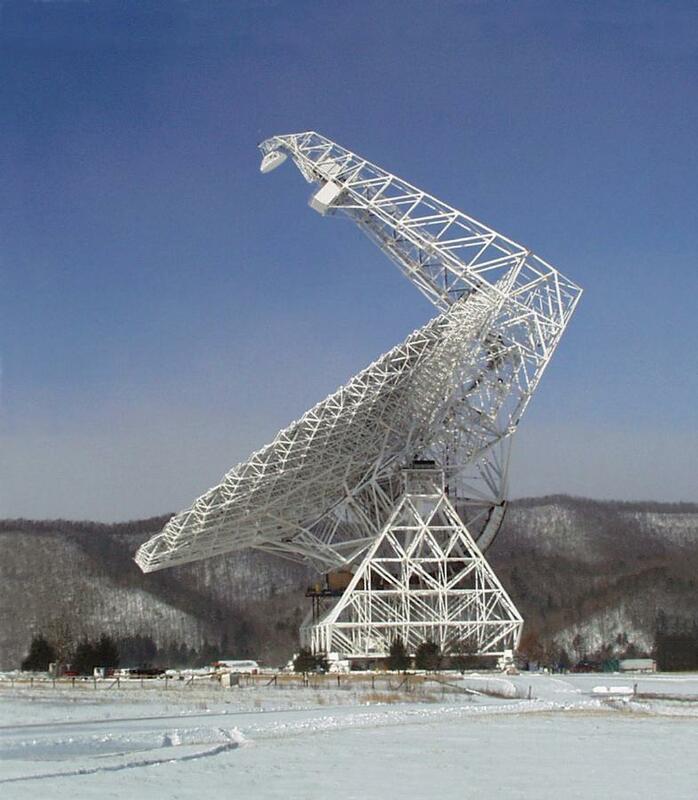 The telescope is located at NRAO's Green Bank site, in rural Pocahontas County, West Virginia. The GBT will be used to study everything from the formation of galaxies in the early universe, to the chemical make-up of the dust and gas inside galaxies and in the voids that separate them, to the birth processes of stars. In conjunction with other instruments, it will help make highly accurate radar maps of some familiar objects in our own solar system. The GBT is an engineering marvel. At 485 feet tall, it is comparable in height to the Washington Monument. It weighs 16 million pounds, yet by swiveling the dish in both azimuth and elevation, it can be pointed to any point in the sky with exquisite accuracy. Additionally, the telescope's two-acre collecting dish has many novel features. 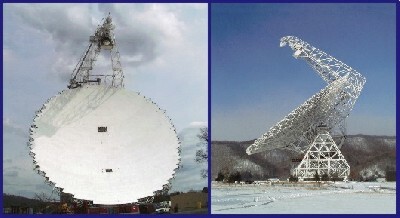 Most radio telescopes in use today use receivers suspended above the dish by four struts. These struts block some of the surface of the dish, scattering some of the incoming radio waves from celestial objects under study. The GBT's offset feedarm has no struts to block incoming radio waves. The GBT also boasts an active surface. The surface of the dish is composed of 2,004 panels. On the underside of the dish, actuators are located at each corner (i.e., intersection of four panels). These actuators are motors that move the surface panels up and down, keeping the (paraboloid) shape of the dish precisely adjusted, no matter what the tilt of the telescope. The combination of its unblocked aperture and active surface promise that the GBT will display extremely high sensitivity to faint radio signals. The GBT itself is not the only precious national resource in Green Bank. The Observatory also administers the National Radio Quiet Zone, which is centered on the NRAO Green Bank site. The Zone extends outward from there, enclosing a land area of approximately 13,000 square miles. This zone is the only one of its kind in the world. Inside it, anything that might interfere with a radio telescope's sensitive receivers - like cellular phones and radio stations - are strictly regulated. This will ensure the GBT clearer reception of radio waves from distant galaxies and the other celestial objects it will study. If all goes according to the current plan, astronomers should be doing exciting new science with the GBT by the first quarter of 2001.